Name: Chris, 52 year old Hispanic female. SUPERFICIAL MOLTED PIGMENTATION, SOME ACNE SCARRING ON CHIN. Second picture: After 7 weeks of professional treatments and home care. 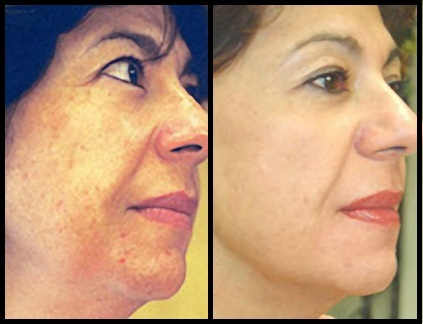 Fabulous results, 85% improvment, acne scarring 95%, skin pores are refined. Client says "I will never have to use covering products anymore, my skin never looked so nice". Client is very motivated by the results and will keep her maintenance treatment once a month. Name: Babette, 36 year old female. PREMATURE PHOTO-AGING, MOLTED PIGMENTATION, SOME ACNE SCARRING. Second picture: After 6 weeks of professional treatments and home care. 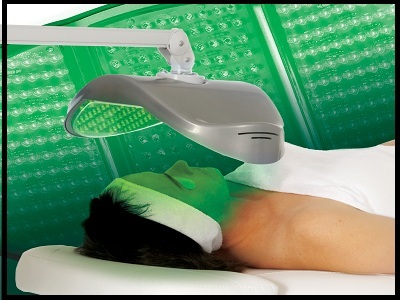 80% improvement on molted pigmentation, 95% on acne scarring, 75% on wrinkles, skin is less coarse and much finer. Client looks younger and is very satisfied; she was primarily concerned with her acne scarring and is very pleased with the results. She is on the maintenance program. Hyperpigmentation (darkening of the skin) also known as melasma (affecting women of child bearing years) chloasma, age spots, liver spots, pregnancy mask, solar lentigines, freckles, brown patches & xeroderma, photo-damaged skin, actinic or solar keratosis are treatable skin conditions. These pigmentary disorders are seen more in females than in males primarily because of use of birth control pills and hormone therapies, Excessive sun exposure, tanning, as well as use of antibiotics, corticosteroids, anti-anxiety or depression medications can also cause hyperpigmentation. Contrary to popular belief, sunscreens are necessary even in the rain and winter time ... so remember, "come rain or sun" ... sunscreen protection is a must! Remember too, that "freckles are the body's warning signs of sun damage already taking place in children. Teach them to practice "safe sun" when they are young so they learn to prevent sun damage. It often takes 20 years from the first sun burn to start showing up as skin cancer, skin tags, melasma, age spots, wrinkles and fine lines, broken blood vessels in the skin, loss of skin firmness, poor healing abilities and more. Applying a good sunscreen is essential for protection from sun damage. So, this is one area where your cosmetic budget should be stretched because it is for the health of your skin! Read the labels on the products you purchase very carefully screening out products that contain ingredients like parabens, fragrance or perfume and others listed by Health Canada. For pregnant women and children it would be safer to ensure that the mosquito repellant with DEET is not applied to skin that also has sun screen containing Avobenzone, Oxybenzone or Octinoxate because there could be a toxic and possibly deep penetrating chemical response to the mixture. While anti-pigmentation treatment results are not rapid, they can be achieved with patience , perseverance and avoidance of tanning and/or excessive sun exposure. 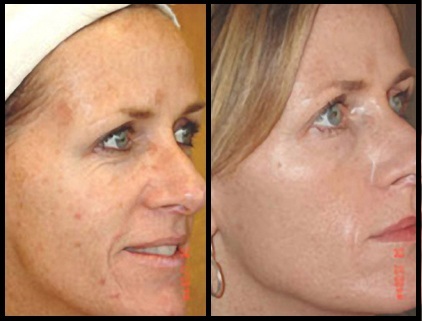 It can take between 4 - 6 months of professional treatments and home care for the skin color to come back to "normal". Call now to take your first step to start treating this problem!